13′ 1 1/2“ – School-record clearance in the pole vault. Mathematics senior Taylor Cipicchio was the Great Lakes Valley Conference champion in the event. 14 – Hits by the Lady Miner softball team in a March 25 win over Christian Brothers. S&T has finished at least one game with 14 or more hits in each of the past nine seasons. 60 – Distance in meters of chemical engineering senior Joe Vellella’s hammer throw at the University of Mississippi on March 22. The throw broke the school record and made an NCAA Division II provisional qualifying mark. 608 – Wins by the Missouri S&T baseball program since its inception in 1966. 4,414 – Round-trip miles that will be traveled by Missouri S&T’s football team in the 2014 season. The Miners have six away games in locations like Nebraska, Texas and Indiana. Two S&T athletic programs announced coaching changes in March. Tyler Fenwick, who served as offensive coordinator at Missouri Western State University for the past six seasons, was named head football coach. He replaces David Brown, who joined the coaching staff at Fresno State University. Gabe Hall, an assistant coach at the University of Dayton for the past two seasons and a former assistant at two schools in the Great Lakes Valley Conference, was named head coach of the men’s soccer program. He replaces Joe Ahearn, who is now an assistant coach at Northwestern University. Read more about them at minerathletics.com. The first season for football in the Great Lakes Valley Conference was a historic one for the Miners. S&T finished with a 10-1 record to tie the university’s single-season record for victories. Even though the Miners weren’t invited to the NCAA Division II playoffs, the team was ranked 24th in the final poll conducted by the American Football Coaches Association. It was the first time since 1984 the program was ranked. “I was very pleased with the way things came together this year,” says Miner head coach David Brown, who stepped down in mid-February to become an assistant coach at Fresno State University. “We learned how to compete and finish. It takes a lot just to have a winning season, so you can only imagine what has to happen in order to win 10 games. It was a total team effort. Jennifer Costello, a senior in chemical engineering from St. Louis, is the Capital One Academic All-America of the Year award winner for Division II volleyball as selected by the College Sports Information Directors of America. Costello is the third player and first female in school history to earn the award. Costello was also named Great Lakes Valley Conference Scholar-Athlete of the Year for volleyball. 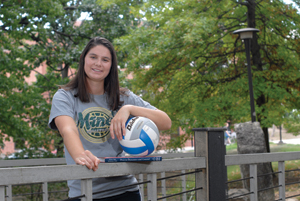 She is the first S&T volleyball player to earn the title and the fifth in school history. Costello also earned first team honors last season. She has been named to the All-Great Lakes Valley Conference first team twice and has been named an Academic All-GLVC selection three times. She has won the M-Club Scholar Athlete Award for the last three years. This past season Costello helped lead the Miners to their second-straight GLVC West Division title and to the semifinals of the conference tournament. She finished her career with 4,361 set assists, 923 digs, 444.5 points scored, 270 kills, 182 total blocks and 80 service aces. 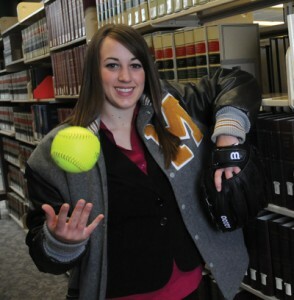 Taylor Keal has been a softball pitcher since she was 10 years old. But she cannot remember being a part of anything like what she experienced on April 10, 2011. 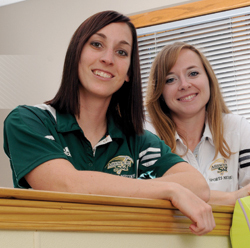 Missouri S&T athletic trainers Samantha Welter (left) and Elizabeth Sisemore (right). When athletic trainers go through certification to administer cardiopulmonary resuscitation or use an automated external defibrillator (AED), they rarely think they will actually have to use that training in real life.